Nushu is a phonetic version of Chinese used exclusively by women in the Hunan Province in southern China from some time around the 13th century until the late 19th century. The language arose because most women in that era did not have the same access to formal education as did men. During the latter part of the 20th century, owing more to wider social, cultural and political changes than the narrow fact of greater access to hanzi literacy, younger girls and women stopped learning Nüshu, and it began falling into disuse, as older users died. The script was suppressed by the Japanese during their invasion of China in the 1930s-40s, because they feared that the Chinese could use it to send secret messages., and also during China's Cultural Revolution (1966–76). The last original writers of the script died in the 1990s (the last one in 2004). It is no longer customary for women to learn Nüshu, and literacy in Nüshu is now limited to a few scholars who learned it from the last women who were literate in it. 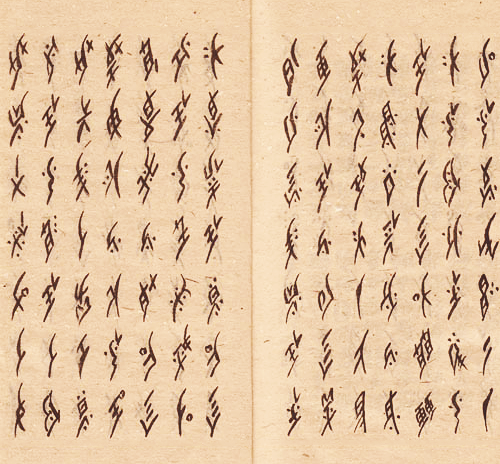 However, after Yang Yueqing made a documentary about Nüshu, the government of the People's Republic of China started to popularize the effort to preserve the increasingly endangered script, and some younger women are beginning to learn it. Nushu literally translates to "Woman's language".